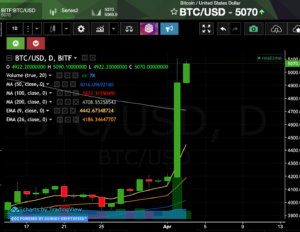 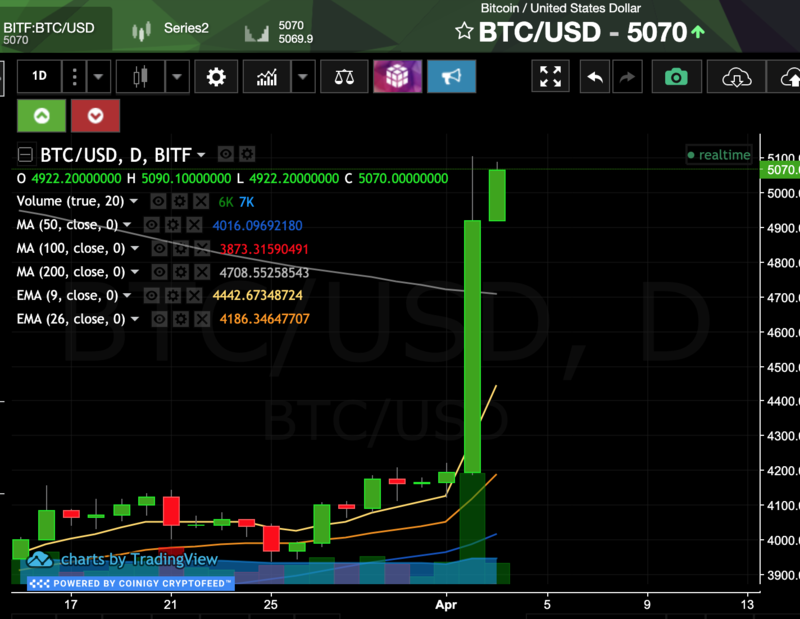 Bitcoin (BTC) now trading at 5070 USD after crashing through overhead resistance at 4200 USD and closes above the 200 day moving average—a very strong change of bear to bull trend indication. 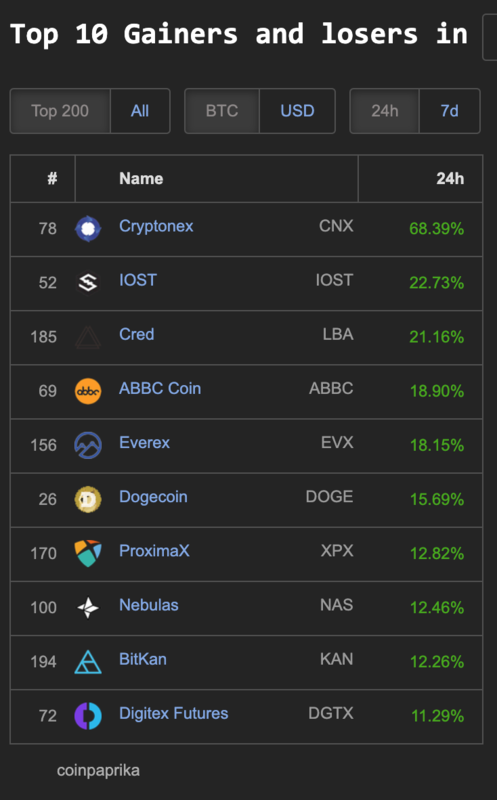 Coin360.io The top ten coins in market cap all have double digit gains: Bitcoin (BTC) 21%, Ethereum (ETH) 23%, Ripple (XRP) 16%, Litecoin (LTC) 37%, EOS 26%, Bitcoin Cash (BCH) 57%, Binance Coin (BNB) 11%, Stellar (XLM) 17%, Cardano (ADA) 29%, and Tron (TRX) 13%. 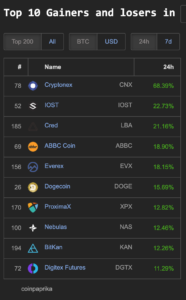 The top 10 coins within the 200 market cap on Coinpaprika.com: Cyptonex (CNX) 68%, IOST 22%, Cred (LBA) 21%, ABBC Coin (ABBC) 18%, Everex (EVX) 18%, Dogecoin (DOGE) 15%, ProximaX (XPX) 12%, Nebulas (NAS) 12%, BitKan (KAN) 12% and Digitex Futures (DGTX) 11%. 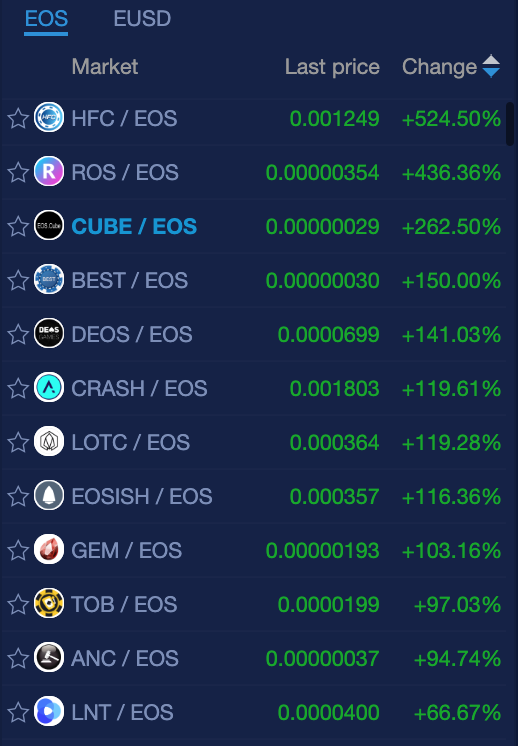 As green as the broad market is today, it doesn’t compare to the nine EOS tokens trading on the NewDex.io with triple digit gains: HFC (524%), ROS (436%), CUBE (262%), BEST (150%), DEOS (141%), CRASH (119%), LOTC (119%), EOSISH (116%) and GEM (103%). 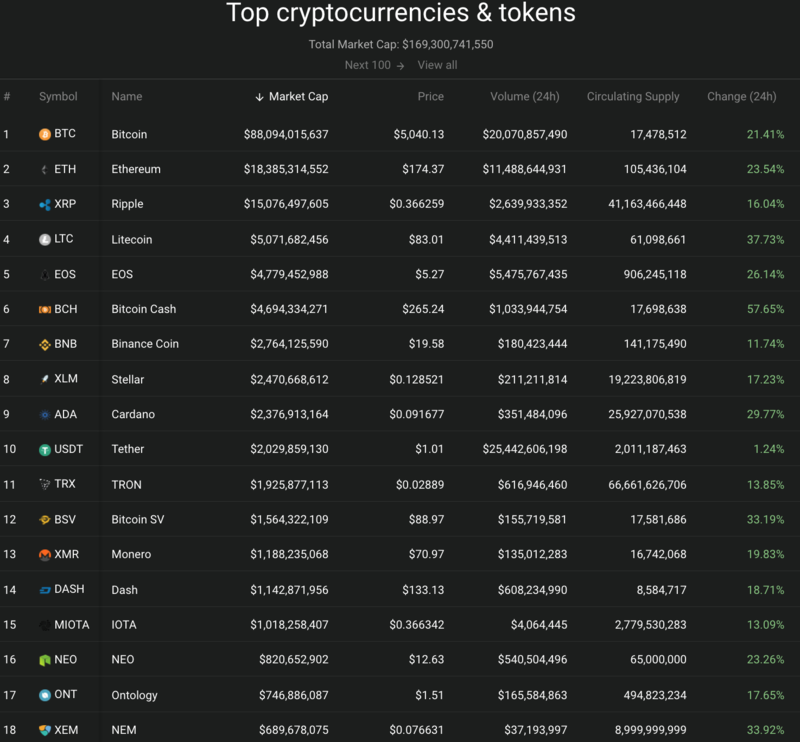 There are 13 other coins gaining double digits—some of the non gambling coins/tokens: ANC (94%), EETH (37%), YT (34%), EOSDAC (26%), CRE (19%), WIZZ (15%), HIG (13%), and ENB (10%). 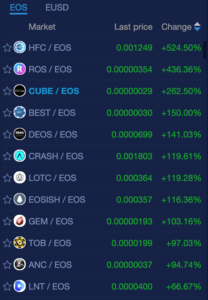 Even on one of greenest days in the crypto market EOS trading pairs maintain the largest gains on NewDex.io. 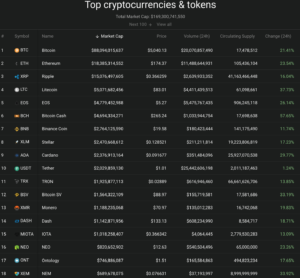 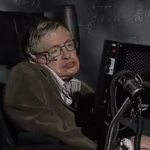 Congratulations to nearly everyone in Cryptocurrency today!